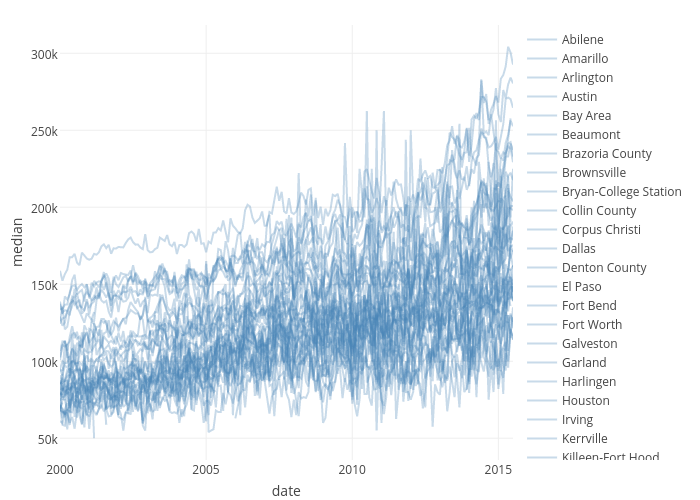 Cpsievert's interactive graph and data of "median vs date" is a line chart, showing Abilene, Amarillo, Arlington, Austin, Bay Area, Beaumont, Brazoria County, Brownsville, Bryan-College Station, Collin County, Corpus Christi, Dallas, Denton County, El Paso, Fort Bend, Fort Worth, Galveston, Garland, Harlingen, Houston, Irving, Kerrville, Killeen-Fort Hood, Laredo, Longview-Marshall, Lubbock, Lufkin, McAllen, Midland, Montgomery County, Nacogdoches, NE Tarrant County, Odessa, Paris, Port Arthur, San Angelo, San Antonio, San Marcos, Sherman-Denison, South Padre Island, Temple-Belton, Texarkana, Tyler, Victoria, Waco, Wichita Falls; with date in the x-axis and median in the y-axis.. The x-axis shows values from 0 to 0. The y-axis shows values from 0 to 0.